RGA provides on-call services as City/Town Engineer, Planner, Inspector, Building Inspector, Building Official, Public Works Director, Community Development Director and District Engineer. On-call services can be provided on an interim basis or as-needed, depending on the specific needs of the municipality or district. Professional services provided on an on-call basis include planning, design, and construction management for infrastructure projects. For a complete list of RGA's On-Call Services, click here. RGA provides on-call engineering, planning, building inspection services and certified operator - responsible charge. RGA provides roadway, storm drainage engineering, cost estimating, capital improvement plans, pavement evaluation, and grant application and implementation services. RGA also processes all site development applications and works closely with the other city departments to ensure a timely review. Grant writing provided by the RGA team members secured over $1 million for the City. RGA serves as the district engineer. 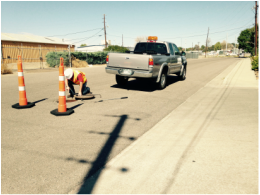 RGA is responsible for all design, bidding, and construction management services for all phases of the District’s annual waterline and sewerline replacements. RGA also provides construction inspection and development review to the district. RGA provides on-call engineering and planning services to the Community Development Department related to development, driveway, excavation, and floodplain applications. This includes review of hydraulic/drainage reports, no-rise certifications, driveway site plans and the completion of site inspections. RGA is also currently assisting the county with an update to their site development and grading standards.